How many monkeys are there in Tokyo? According to a TV station on monkey-watch, there may be more than the original one mad-monkey of last summer. The tale of the monkey in the city began Aug. 20, 2008 when a wild Japanese macaque appeared during morning rush hour in Shibuya train station in Tokyo. The monkey avoided police capture, ran through the crowd and got away. Experts belive the simian came to town from mountains outside the Tokyo metropolitan area. 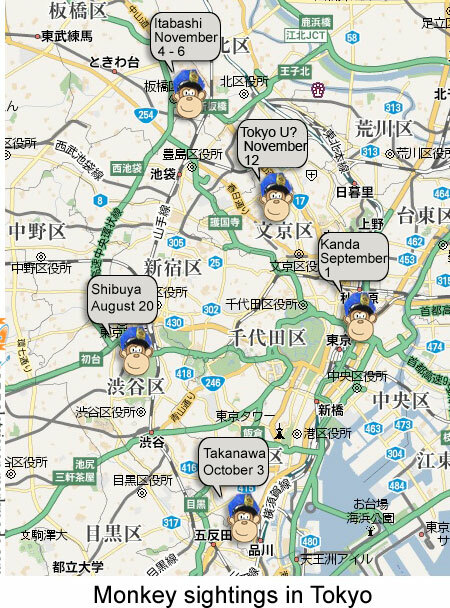 Since August, according to eyewitness accounts, monkeys have apparently popped up in four areas of Tokyo. Our own source provides anecdotal evidence of a monkey scampering around Tokyo University November 12, 2008. TBS-TV Evening 5 news in Tokyo is tracking the monkey. Click here for photos, video and the complete Shibuya Monkey Timeline.